James Dungu, Lam James and I left for Lodwar on Monday 7th of May at 10 p.m., knowing that the community of Nakwamekwi was having spiritual retreat that week. So we had to find our way to the mission because no one could come to pick us up on the way. We traveled all the night from Nairobi to Kitale. We left Kitale at 9:30 a.m. to reach Lodwar at 4:00 p.m. Since no one was picking our calls we had to find our way to the community alone. Once we reached home we send a message to let the confreres know that we had arrived. The weather condition: weather started changing right away from Kitale as we were going towards Lodwar from cold to warm and hot, so I had to take off my shirt because of the heat. The language: when I attended the small Christian communities for example, I needed two translators: one to translate from English to Kiswahili and another from Kiswahili to the local language. I was helped by the Deacon Kerri Malwa who was also translating for the priests in Nakwamekwi parish. 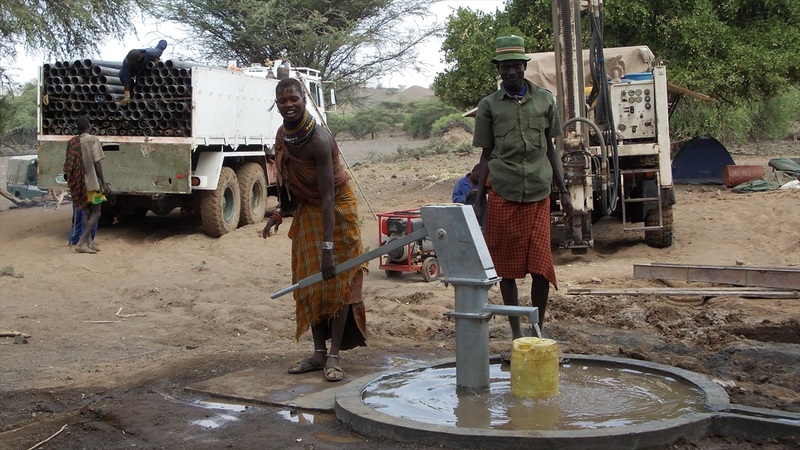 The Turkana people: I was so happy to see people greeting each other on the way. It is like Sudanese culture where one cannot pass close to anybody without greeting him or her. People are so generous. I really felt at home. The Community of Nakwamekwi: it is a very open and free community comprised by three priests: Fr. Simon, Fr. Aron and Fr. David. Theologian Kerri is also there with them. He lately became a deacon and will be ordained a priest in October this year. The community is free in such a way that confreres like making jokes and enjoy staying together. They also work together with the Assumption sisters of Nairobi. In one occasion, Fr. Aron made a joke in the presence of the sisters reporting that Comboni had said that “the mission without sisters would be like heaven without mother Mary.” He made us all to laugh for long. I think that is beautiful when the workers of the Lord are in communion. The whole community has mass and super together with the sisters every Monday. They do prayer services together every Sundays in different stations. On weekdays they go to schools, to the pastoral Center and to the small Christians communities. Pastoral work: we were introduced to the communities, outstations and the places of work during the first two weeks. Then we started going for our ministry in the schools during weekdays, at the Parish on Sundays and at the high schools once in two weeks. At the Parish I observed first what I could do since we were somehow left to choose for ourselves the areas we can help at. So I chose to teach the Children of PMC which is known by Sunday’s school. I also taught English songs at the Comboni high school. And I accompanied the altar servers. Children: I had joyful moments with the children though the language was a problem: only few of them could speak English or Kiswahili. So, I had their teacher to translate for me and they could get what I was saying. As Jesus said “let the children come to me… for the Kingdom of heaven belongs to them.” (Matthew 19:13-14) They made me happy and I could always have a nice smile on my face while playing, teaching and listening to them. Joy filled my heart. The high school’s choir: I realized that the choir of Comboni High School was repeating every Sunday the same songs. So, I asked the sister in charge if I could teach them new English songs. She happily agreed. We had practice every Saturday. The students were very much interesting in learning new songs and so, they learned many songs in a short time. You could imagine my joy when they sang some of the songs I taught during our last Sunday in Lodwar, it was so nice to know that my hard work had not been wasted. On the following day, we were welcomed by a mother who is a teacher in the primary school of the outstation called Nagis. Fr. David went to the neighboring chapel so we had to wait. She gave us chairs to sit on and bought us a soda to drink. The soda was hot due to the weather and lack of power. We asked ourselves how we could drink it like that. But we had to seeing how the mum was happy to have us with her: she called her children and relatives including her old mother to come and greet us. So without realizing it, we finished the soda because of her the good heart. It was not finished, she asked her daughter to boil the tea for us. We would not accept but the daughter ran with joy saying that it would be ready in only five minutes. Unfortunately, Fr. David arrived and we had to leave for the Parish. We were very happy and shared all these stories that happened to us. It was a wonderful day. Apart from all these things, we had the commitment to go to an outstation to buy firewood for the Comboni primary school. And then also taking food to the schools. It was nice but very tiring because of the heat. Sometimes we would get home late and go straight to rest forgetting about food because of tiredness. But because there was a real need for it we could sacrifice ourselves to help the students of the schools. I therefore recalled the statement of Comboni “I am ready to give up everything and suffer the hardest fatigue and discomfort in the accomplishment of this holy work” (Comboni, the man and his message by Aldo Gilli, P34). On the last day the people wished us well and promised their prayers for us. They also asked when we would have gone back to Nakwamekwi? We smiled at them saying: “We do not know, but pray for us!” It was the first of June when we left Lodwar for Nairobi with Fr. David. We arrived on the third of June at 8:40 p.m. When I reflect on this experience I understand that a person without love for the mission cannot stay in places like that. As it is written in the Book Comboni, the man and his message “the great work of God is not accomplished either by the learned or the saints but by those inspired by God.” I would love to be among them in order to fall in love with the mission I will be sent and work for Christ our master! This is my prayer for me and for all missionaries in the whole world. This image comes from our mission in Lodwar. It was taken several years ago after a bore-hole (well) was installed at the mission.